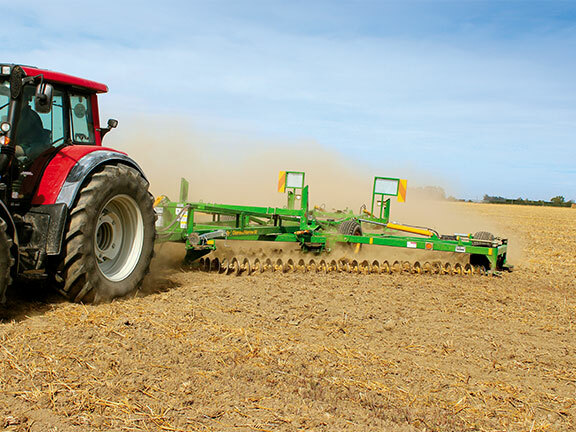 Brent Lilley puts the Kelly Diamond Harrow to test and finds that the well-thought-out design of the machine ensures it is equipped to handle whatever is thrown at it. It seems to be pretty common with all farming enterprises that profit margins are constantly being squeezed. As cost inputs rise and sale prices fall, often both at once, luckily there are businesses looking at ways to help farmers decrease costs. 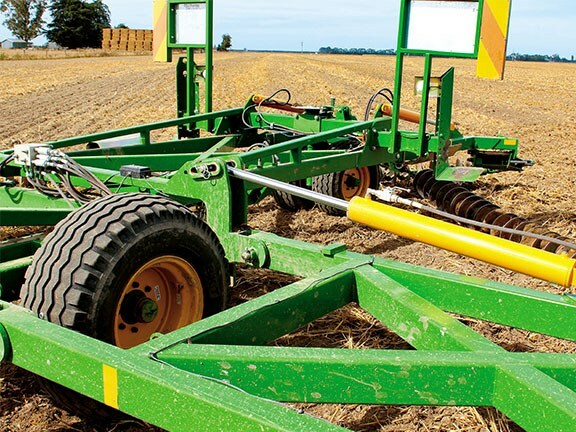 In the arable sector, any machinery that can decrease the number of passes required to create a seed bed while improving the end result will be of interest to most. I recently had the opportunity to see a machine that aims to do both: the Kelly Engineering Diamond Harrow. Designed and built in Australia, the Kelly Harrow is used to cultivate the top 30-40mm of soil, destroying weeds and chopping up crop residue, incorporating it into the soil to improve the seed bed. It allows a wide area to be covered at a reasonably quick forward speed, so a large amount of ground can be covered in a short period of time. The unique disc chains and their arrangement in a diamond pattern offer some clear benefits, which I discovered when I tried the machine in a variety of conditions. A substantial frame is the backbone of this machine, holding the disc chains in a diamond pattern. Incredibly well built from heavy-duty high-grade steel box section, the frame is well braced and provides a solid stable platform. Up front, a hydraulic cylinder is incorporated into the drawbar. This is used to level the machine and keep it running parallel with the ground – key to an effective and level finish. 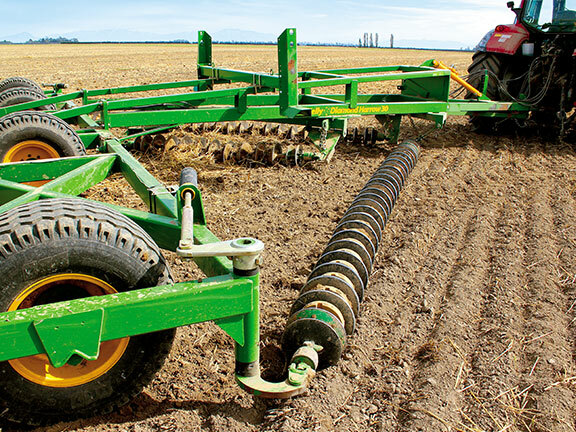 Wheels spread the weight of the machine evenly over the ground to minimise soil compaction and help ensure it follows the ground contour. Two caster wheels at the rear are positioned to take the weight of the machine when folded. To prevent them wobbling, they are offset from each other with a disc brake on top of the spindle they are mounted on. There is a range of tyre sizes available. The machine I tested was running BKT 15/70–18. 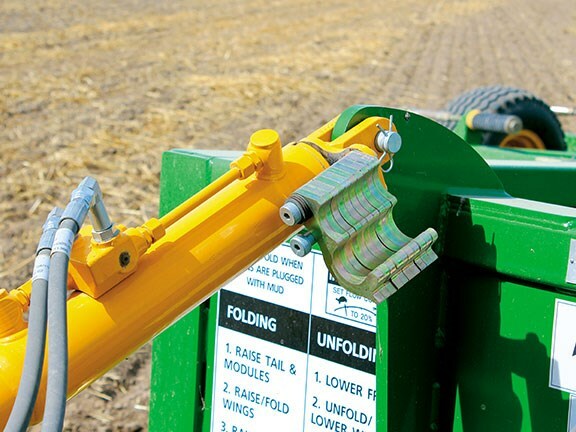 Wings on either side of the machine stretch the working width out to 9m when in the field. A slotted hole allows the wings a limited amount of float up and down to follow the ground contour. Hydraulic rams fold the wing vertical for road transport, and although this brings the machine width down to 3.5m, it is still reasonably wide for the road and gateways, which may be an issue for some. A tail section at the rear also folds up for transport to lift the chains up and keep the overall length down. Steel plates are strategically placed on the frame to hold the disc chains in the transport position and prevent them rubbing on the main frame scuffing the paintwork. A transport lock on the wings and tail, when folded, is a useful safety feature. 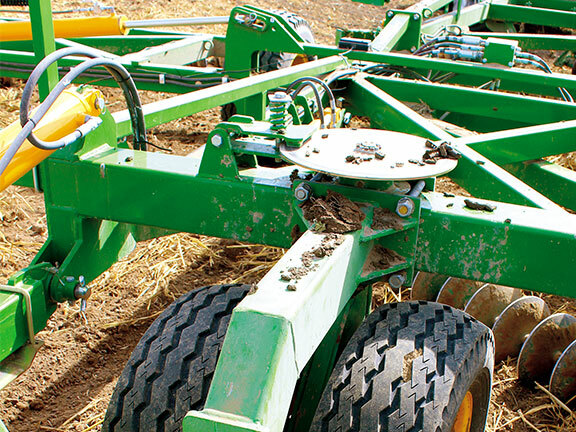 The key to the success of the Kelly Diamond Harrow is in the unique design of the disc chains. Each disc has a hook on one side and an eye on the other, so they can link together to form a chain. Cleverly, the design of the hook ensures the discs will not come apart when working. Kelly Engineering offers a choice of discs to suit the conditions where it will be working. Luckily for me, the machine tested had two different types fitted. On the rear of the machine tested was the CL1 disc, which is the original disc designed by Kelly Engineering. 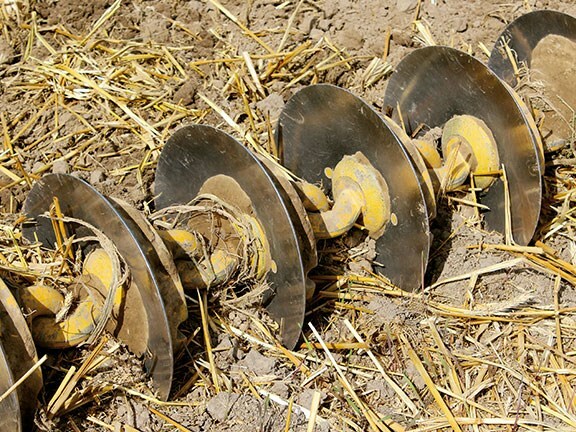 It is a single-piece concave disc made from hardwearing cast steel alloy, ideal for smashing up crop residue, destroying weeds and levelling the soil. Discs are spaced at seven inches and provide around 70kg of weight per metre of chain. The company reports that people with these discs are getting at least 15,000 hectares of use before they require replacement, which is a huge amount of ground for minimal wear costs. On the front of the machine, CL2 discs use a replaceable steel concave disc mounted to a cast steel boss. A hook and an eye link them all together. This is much sharper the than the original disc and also much heavier, leading to better soil penetration and chopping action in tough conditions. The shape of the cast steel boss keeps all the discs cutting to a uniform depth while adding weight. Discs are spaced at eight inches and they add 112kg of weight per metre of chain. The suggestion is that they will cover around 8000 hectares before the discs need to be replaced. It was great to see both types of disc on the machine and see what they can do. 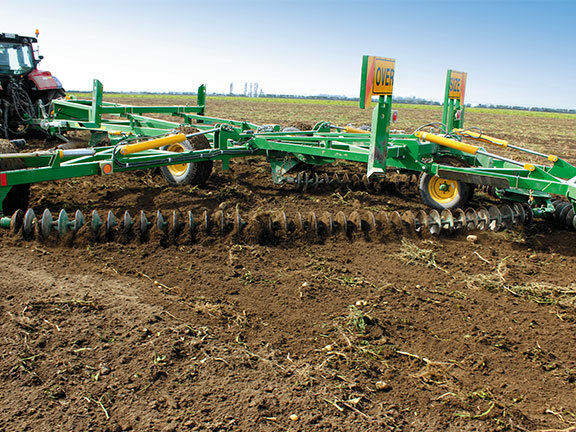 The CL2s on the front are used to bust up the hard soil and begin to chop crop stubbles, while the duller edge of the CL1s on the rear help break residue to promote breakdown and soil mixing while leaving a level seedbed. At each end of the disc chain is a swivel that allows the whole chain to turn and roll along the ground. Like the rest of the machine, this swivel is well built. Two heavy-duty bearings are enclosed inside a steel housing. This is then screwed together to prevent soil getting inside and a tack weld prevents it from coming unscrewed. The slim, smooth profile of the swivel also helps prevent material from wrapping and tangling around the chain. 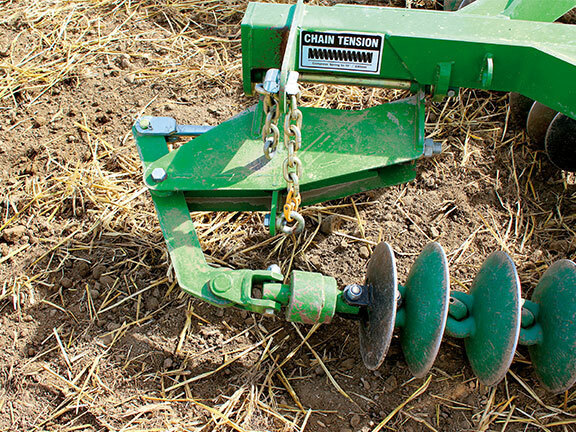 Keeping the chains correctly tensioned is one of the few crucial items of maintenance on the machine to ensure the disc chains run true, are effective, and prevent unnecessary wear. The way the cleaver tensioners pull also ensures the disc chains will stay locked together. A compressed spring on a threaded rod ensures there is always tension applied and can easily be tightened with a spanner (provided with the machine) to keep the correct tension. An adjuster at the inside end of each chain uses a slotted hole and a chain to raise and lower the main disc chain. This allows for a degree of fine tuning to leave a level finish. The end is lifted or lowered to open or close the centre furrow to leave a perfectly flat and smooth finish. For this test, we had three different conditions to see how the machine worked in various situations. First, we attacked some standing brassica stubble to be incorporated back into the soil. I was immediately impressed. The thick stem was ripped out of the ground, chopped and smashed, and then incorporated back into the soil in a single pass with excellent results. After this, we moved on to some spud ground that had recently been harvested. This can be a tough task for most machines with the tops scattered over the ground and ridged beds to level out. Once again, I was impressed and, even though only cultivating to a shallow depth, on the surface it is moving a serious amount of soil to level out the rows and fill any ruts. Lastly, we moved on to cereal stubble, and while this was probably the easiest task of the three, it was no less impressive. The Valtra T213 tractor on the front of the Kelly Harrow was sitting at a respectable 13km/h. With a 9m-wide machine, it was covering around 10 hectares per hour. With turning time on the headlands and some overlap accounted for, this is fairly impressive. I am sure some may argue it is not entirely accurate, but the fuel usage monitor in the Valtra was reading that on an average, it was sipping on 32 litres of diesel per hour or around 3L/ha, which is fairly economical in my opinion. The Kelly Harrow is built by farmers in Australia and is a well-thought-out design equipped to handle whatever is thrown at it. Overall, I was impressed by how well it handled the three different situations with no alterations or setup required in between. It is just a matter of unfolding and getting on with the job. While a wide transport width may be an issue for some, there are other smaller models available with narrower transport width. The proof is in the quality of the finish and the work rate for me. It did an exceptional job incorporating crop residue and had a good work rate that was economical. It is a versatile machine that I’m sure will prove popular with many.